Human beings have the ability to direct attention. With minimal effort, right now, you can place your attention on the toes of your left foot. You can feel the sensations in the back of your neck. You can open awareness to the thoughts flickering through your mind. This natural ability, cultivated, is called mindfulness. When people cultivate mindfulness, good things happen. Calm develops. Rumination decreases. Stress responses ease. Working memory improves. Focus increases. Love grows. Relationships improve. And much more. In this half-day workshop, participants will learn the basics of mindfulness meditation. During periods of guided practice and mindful group activities, we’ll build a foundation to help folks use these time-honored practices to improve the quality of their daily lives. Come join us! This workshop is open to people of all faiths, persuasions, races, ethnicities, nationalities, ages, resources, sexual orientations, gender orientations, and ranges of ability. *Please bring your yoga mat and a meditation cushion if you have one. Devon Hase began intensive meditation training in 2001. After completing two graduate degrees and a decade of teaching high school and community college classes, she entered a two-year period of retreat. Following this, Devon was invited by Joseph Goldstein and DaRa Williamsto be a part of the IMS teacher training cohort, an honor she gratefully accepted. Currently, Devon coaches meditators on the 10% Happier app, assists retreats at IMS and Spirit Rock, and leads mindfulness and meditation workshops in the US and Europe. 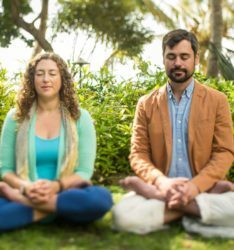 In 2015, she co-founded SATI: Mindfulness Workshops Bringing Mindfulness to Life with her husband, Craig.